The ERC Soft has completely reinvented how a distance ball performs with our new innovative Hybrid Cover. This multi-material cover creates an exceptional combination of faster ball speeds for longer distance, incredibly soft feel and noticably higher spin for excellent control around the green. 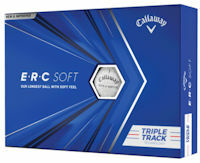 The ERC Soft prominently features Triple Track lines on the ball for improved putting accuracy. The Triple Track uses Vernier Visual Acuity to improve alignment compared to a regular side stamp alignment aid. Select the type of imprint you want on your golf balls. Logo artwork can be sent via email, or artwork from a previous order may be used. Select the appropriate option during checkout. The minimum quantity for this item is 2. For most items in our store, you may add less than the minimum required to your cart, but must checkout with at least the minimum in your cart.